How “Jewish Christian” became an oxymoron! 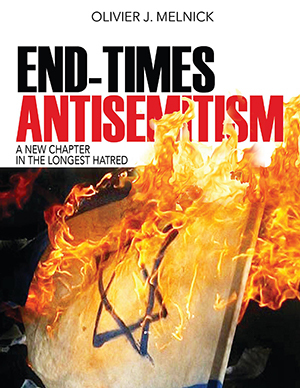 You are here: Home / Antisemitism / How “Jewish Christian” became an oxymoron! There are words that just don’t co-exist very well, and “Jewish Christian” is definitely one of these dysfunctional couples that we call oxymorons. People say that you cannot be Jewish and Christian at the same time, because the two terms are mutually exclusive. Christians are often confused about Jewish people who have placed their trust in Yeshua (Jesus), while most Jews are simply upset that other Jews who trust Yeshua would dare to continue calling themselves Jewish, so definitions are in order. We first hear the term “Christian” in the New Testament, in Acts 11:26: and when he had found him, he brought him to Antioch. And for an entire year they met with the church and taught considerable numbers, and the disciples were first called Christians in Antioch. A simple definition of the term would be “a follower and disciple of Yeshua of Nazareth.” The word Christian comes from the word “Christ” which is the English translation of the Greek “Christos”, or Hebrew “Mashiach”, meaning “Messiah” or “anointed.” Becoming a Christian involves a decision on the part of the person to follow the teachings of Yeshua (Jesus) and obey His commands. One is not born a Christian since it requires an act of the will to become one. As to who is Jewish, many interpretations have surfaced over the centuries, trying to define who is a Jew. From having two Jewish parents to just one, particularly a mother who is Jewish, or even just grand-parents. Some say that you have to be religious or live in Israel or even both. What about one who converts to Judaism, does that act make them Jewish? Biblically speaking, a Jewish person is a descendant of Abraham, Isaac and Jacob through one of the twelve tribes of Israel. In the Bible, the lineage went through the father or both parents. The change to being Jewish if the mother is Jewish was a medieval rabbinic decision made at a time when many Jewish villages were pillaged, men killed and women raped. In fear of losing their Jewish identity and the Jewish people as a whole, rabbis decided that if a woman was Jewish, the child from their womb had to be as well. This wasn’t a bad decision from the standpoint of preserving the Jewish people, but it departed from the biblical definition when for some Jewish people it became exclusive. Regardless of being from one parent or both, or even just through the mother, were are faced with a further need for defining who is a Jew, simply because too often people confuse Judaism and Jewishness. A clear understanding of both terms will help us with many misconceptions. Judaism is a religion or a set of spiritual beliefs that one adheres to, to the best of their ability. Within Judaism, there are different levels of observance from very nominal to ultra-religious, and everything in between. The practice of Judaism isn’t simply reserved to those who were born ethnically Jewish (Jewishness), but rather it is made available to all who choose to place themselves under the regulations of the Mosaic Law. So, you can be a Jew practicing some level of Judaism or a gentile doing the same, without ever losing your ethnic identity. By the same logic, A Jewish person can also choose to practice Hinduism or Buddhism and continue being Jewish ethnically. To add insult to injury, my people have also been accused of many ills over the centuries. We have been accused of using the blood of Christian children for Passover rituals, poisoning the wells of Europe to start the Black Plague, attempting to take over the world, controlling the banks, having horns and a vile stench. All these false accusations can easily be debunked, even though people an increasingly less interested in factual truth when it comes to Israel and the Jewish people. So the word Jewish Christian did become an oxymoron for two reasons. First, because people do not have a clear understanding of the difference between Jewishness and Judaism. Second, because much harm has been done to my people over the centuries in the name of Christianity. But just because many have misrepresented true biblical Christianity to the Jews, it doesn’t take away what real Christianity stands for. The Jewish Messiah can be found all over the Tanach (Old Testament) in places such as Genesis 3:15; 49:10, Psalm 22, Isaiah 7:14; 9:6-7; 52:13-53-12 and Zechariah 12:10 to name just a few. True Christianity is simply a healthy and balanced fulfillment of biblical Judaism. So maybe “Jewish Christian”–not my favorite choice of words to start with– isn’t such an oxymoron after all! Remember that Jewishness is on the inside and Judaism is on the outside, and they are not necessarily connected. Christianity is a faith and Jewishness is an ethnic state. They absolutely do not have to be mutually exclusive!